Efficient Admin (a.k.a. Michelle) enjoys healthy cooking, and she has all of her salad and stew recipes memorized. 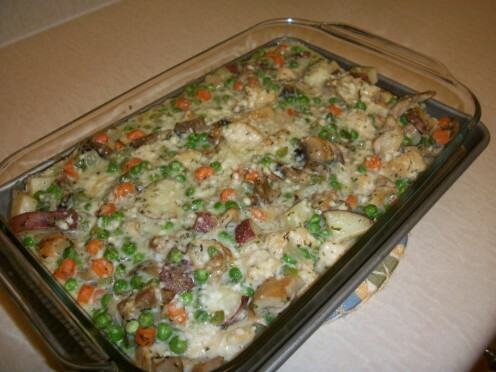 Here is a nice hearty, but healthy, meal for colder days in the fall and winter. To save time, buy pre-chopped vegetables and a rotisserie chicken at the supermarket. 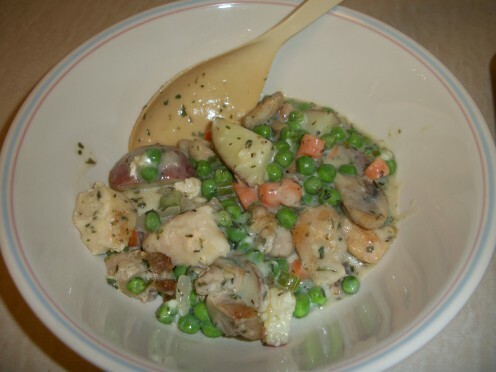 What is so special about this particular Chicken Potpie recipe? 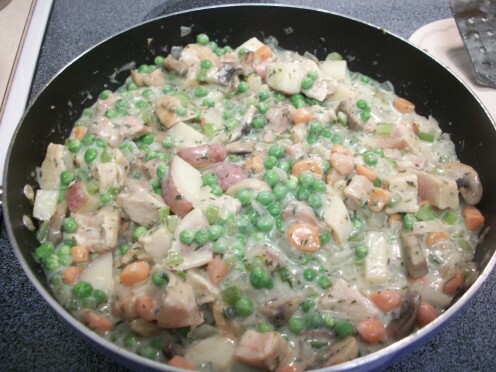 What is so special about this chicken potpie recipe from all the millions you may ask? The answer is you don’t need dumplings or the phyllo dough to enjoy a fantastic, tasty, and healthy version of this traditionally calorie-laden dish. The flavors of this dish are unique. I have included instructions for adding the phyllo dough but personally make this dish without the dough and it is fantastic. This dish also freezes really well, even with potatoes. You can make a giant batch of it and freeze for later for a convenient homemade meal. 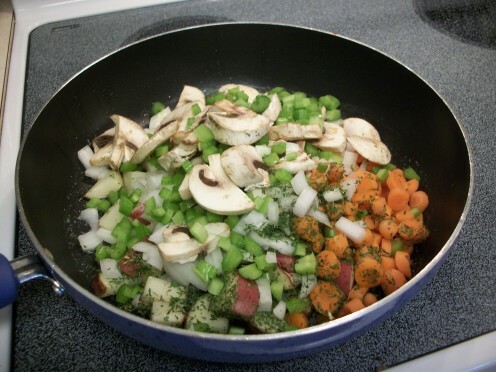 Also included with this recipe is information on the health benefits of eating mushrooms, carrots, and garlic -- three ingredients this dish has. 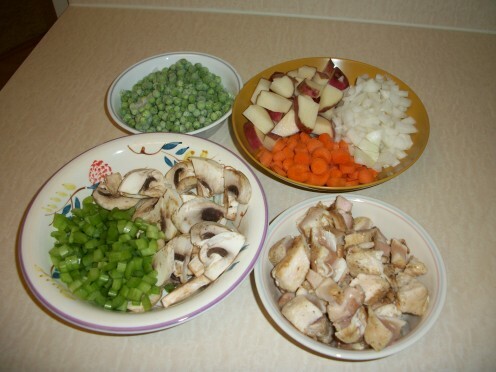 Potpie has a colorful history which goes back to the Roman Empire but originated from Greece. Potpie was served at banquets and at times was served with live birds under the crust, which probably startled the guests! The Greeks cooked meats and placed them in pastry shells. It was the Romans who added the top crust which made this dish into an actual pie. Chicken potpies and meat variations have become as American as corn on the cob or apple pie. For the following recipe I have played around with the ingredients several times and discovered another option with the ingredients: you can use dark chicken meat instead of white. Cook cook the thighs in a crockpot with white cooking wine, garlic, and lemon juice to use in this recipe. Use any leftover chicken for another recipe or in an entrée salad during the week. Preheat oven to 375°F. Melt butter in a large saucepan over medium-high heat; add oil. Add potatoes and the next 6 ingredients (through thyme). 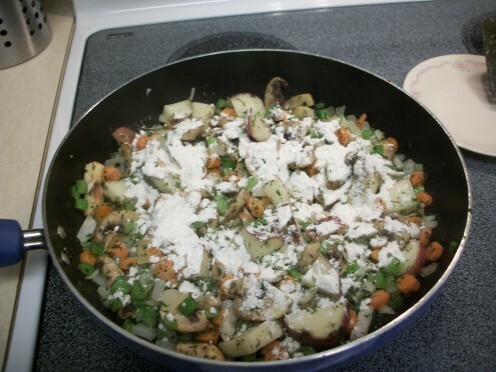 Reduce heat to low; sprinkle flour over vegetables. Cook for 5 minutes, stirring frequently. Stir in milk and broth. Increase heat to medium-high; bring to a boil. Reduce heat, and simmer 5 minutes or until thickened. Add chicken, minced garlic, peas, salt, and pepper. Spoon mixture into a 9x11 glass baking dish. Sprinkle with the parmesan cheese. Place 1 phyllo sheet on a large cutting board or work surface (cover remaining dough to keep from drying); lightly spray with cooking spray. Repeat layers with cooking spray and remaining phyllo. Place phyllo layers loosely on top of mixture in dish. Place dish on a baking sheet. Bake at 375°F for 20 minutes or until top is golden. Mushrooms have been used in traditional medicine in the East for centuries. The shiitake has been used in Japan for a variety of disorders. It has been used to prevent heart disease, build resistance against viruses and disease, and treat fatigue and viral infections. In China during the Ming Dynesty, this mushroom was recorded as increasing stamina and in the 15th century was given to warrior priests for energy. Mushrooms are also a useful source of iron. They contain about 1mg of iron per 1.5 cups. Unlike many vegetable sources of iron, mushrooms do not contain phytates, which reduce the body’s ability to absorb this mineral, so the iron present in mushrooms is readily absorbed. In Chinese medicine, carrots are used to stimulate the elimination of wastes and to dissolve gallstones and ancient Greeks drank carrot juice as an aphrodisiac. In the West carrot juice is known by herbalists for diuretic action and as a treatment for heartburn. Carrots are one of the richest known sources of beta carotene. This antioxidant has the ability to soak up and make harmless the dangerous by-products of metabolism and pollution known as free radicals, which are believed to be able to damage cells and start cancer. The traditional belief that eating carrots can help you see better at night is well founded. Night blindness is usually due to a lack of the substance visual purple, which requires beta carotene for its formation. The beta carotene in carrots will help to ensure that visual purple can be produced. Does potpie without the pastry sound appealing to you? No, I need the dough on it. The medicinal benefits of garlic have been recorded since ancient times. Archaeological evidence indicates that garlic has been cultivated in Central Asia from at least 3000BC. A member of the onion family, garlic has been used to treat bronchitis, colds, whooping cough, and influenza. An average serving of garlic is less than ½ ounce. The quantity of nutrients supplied is low compared to the daily recommended intakes. However every clove is full of sulfurous compounds that fight infections. Choose plump, unbruised bulbs that are neither soft and soggy, nor starting to dry. Avoid torn skins and bulbs with sprouts. Keep for several weeks in a dry place where air can circulate, and away from other vegetables. Garlic is well known for its ability to help circulation and inhibit colds. Garlic’s antibacterial effects are also well documented. In World War I surgeons used garic juice to stop wounds from becoming septic. Garlic may reduce levels of low-density lipoprotein (LDL) cholesterol, increase levels of high-density lipoprotein (HDL) cholesterol, and decrease blood fats. The allicin and other compounds appear to bring about this effect. Studies have found that low blood fats and high garlic consumption are common, and that adding fresh garlic to cooking may help decrease the risk of heart disease. When garlic is crushed, it produces Ajone, one of the volatile substances produced, and appears to reduce the formation of blood clots. Powdered garlic (equal to 2.5g of fresh garlic) has been shown to lower blood pressure. Garlic has also been shown to fight many of the bacteria that cause food poisoning, including Salmonella. Since garlic has antifungal properties, it has been reported it is more effective than drugs against fungal infections such as yeast infections. Due to allicin compounds, it is thought that garlic can prevent stomach cancers in the stomach wall. Because garlic’s antibacterial effect is so important, it can help act against Helicobacter pylor, the bacteria that causes stomach ulcers, which in turn can become cancerous. Caution: garlic may interfere with diabetic drugs. Doses of garlic should not be given as a remedy to those on anticoagulant therapy, or to pregnant women, as they may cause contractions. 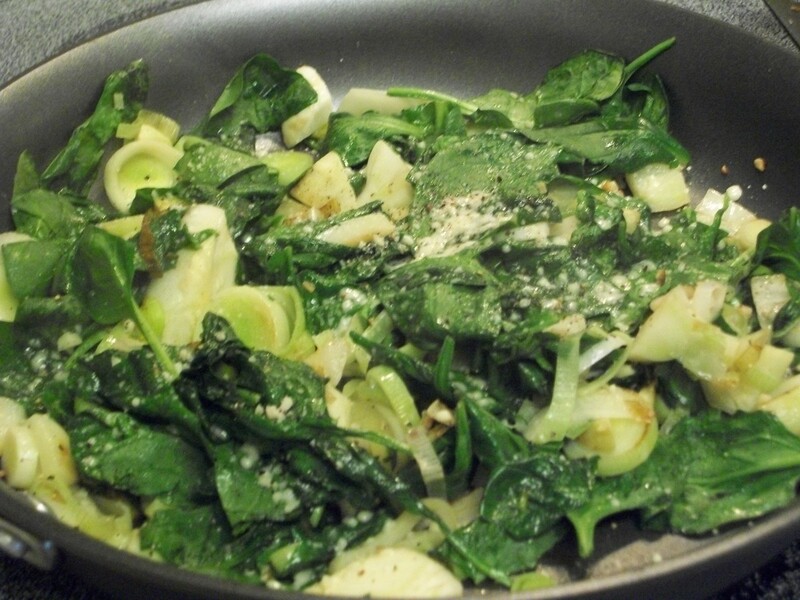 Spinach is an excellent source of Iron, Calcium, Vitamin A, Vitamin C, Vitamin K, Folate, and Manganese. 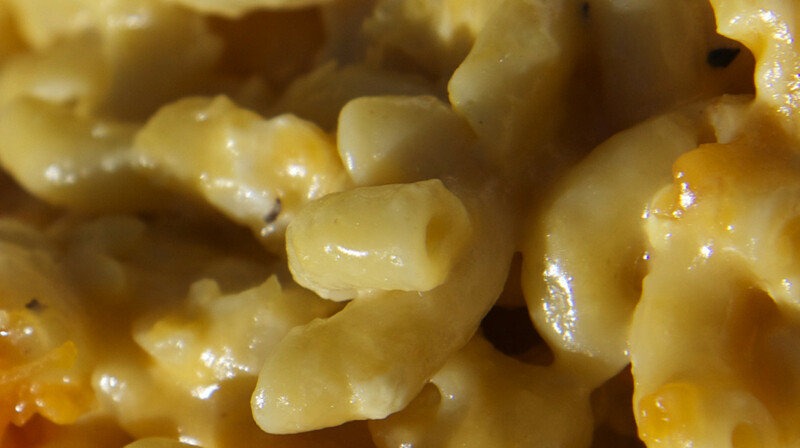 Milkless Mac & Cheese recipe. No milk needed! Karim - sounds like you are trying to eat clean and doing well at it. 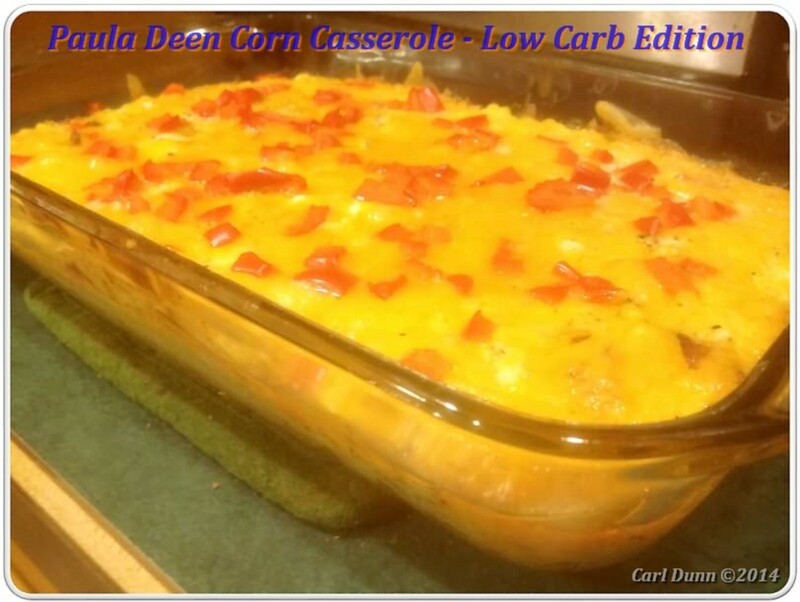 This recipe can be used with or without the crust and I make the chicken myself as well but use a crockpot. It's so worth the time and effort to cut up raw ingredients and cook them yourself. I hope you enjoy this recipe very much. Thank you for reading and commenting. 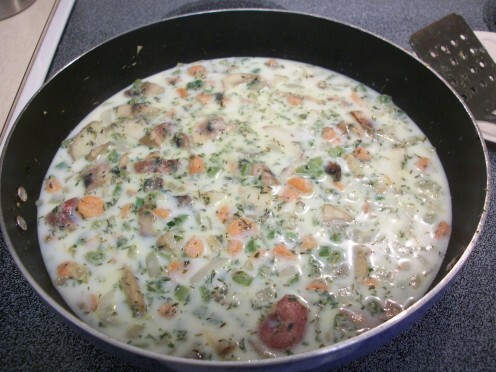 KoffeeKlatchGals - this is the lighter and healthier version and the flavors in this dish blend together for a unique flavor without being too heavy. I hope you get a chance to make this recipe and enjoy it. Let me know how it turns out for you. Thank you for reading and commenting. I love this recipe. Chicken pot pie is one of my favorite foods. Now that I am going on a diet I will definitely use your recipe. peachpurple - I hope you get to try this recipe. There are many flavors blending together without the high fat calories. Thank you for reading and for commenting. Billy you are now signed up. I am with you on this and especially love this dish when the weather cools down. I hope you get a chance to try this one and let me know how it turns out. Thank you for visiting and commenting. Sign me up. I have loved chicken pot pies since I was a kid, and the love affair continues. Thanks for the recipe my friend.